Luis and Patricia Almaraz, of Islandia, try their luck at the lottery. After buying a Wild Bonanza Multiplier scratch-off ticket, their luck changed for the better. 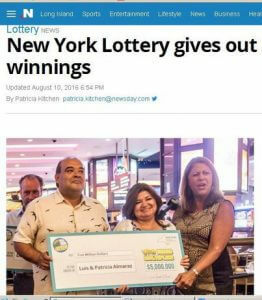 The couple won a $5 million dollars; enough to cause Luis to go back to his car and cry the minute he learned of the win. The couple will split the prize. After the taxman took his bite, the couple still had $1.6 million to take home.